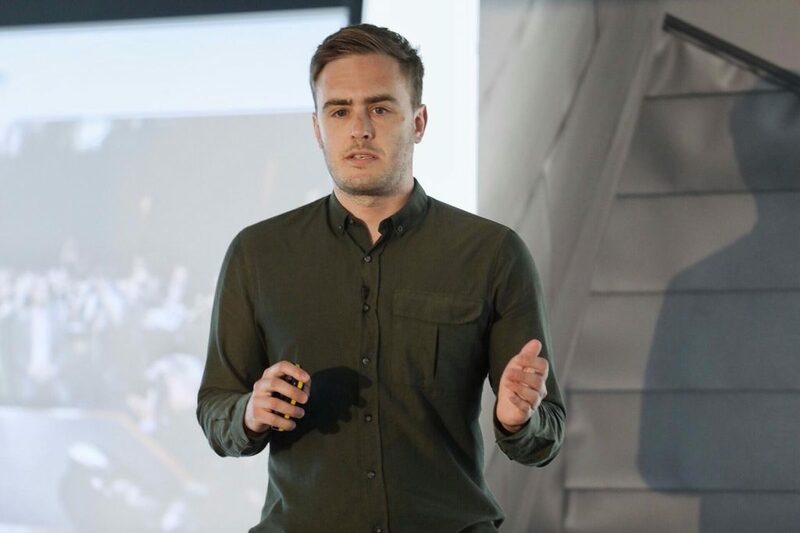 After graduating from BA Television and Radio in 2009, Sam Jones found himself in a difficult situation after the 2008 recession had absorbed a huge amount of media jobs in the North West. Unemployed and needing an income, Sam enrolled on a council-funded master’s program, which saw him placed into multiple work experience placements. After this year long opportunity came to a close, Sam was still seeking employment in the media industry, and seemingly having no luck. So, what do you do when there are no companies to employ you? You start your own. Believe it or not, this is how the award-winning digital marketing agency ‘Tunafish Media‘ was born. I was fortunate enough to meet with the marvel that is Sam Jones, to find out how this seemingly ordinary Salford alumnus hedged his bets as a bar worker, to become the Managing Director of his own agency less than a decade down the line. What made you chose Salford? Originally, I wasn’t planning to go to Salford, I’d actually applied for Bournemouth, who accepted my application. However about a month before I’d got cold feet, and realised I’d only spent about three hours there and that was for my interview. I decided to spend the weekend there, and it really didn’t leave a lasting impression on me. I saw the appeal, but it just wasn’t for me. I wanted a city with a slightly faster pace, something that Salford and it’s close proximity to Manchester could offer. What was life at university like? It was brilliant! The campus and facilities were in a much different place to where they are now. I was living in a three story house in the former student quarters with twelve others, all lads. It was chaos. Although they were all brilliant people, most of which I’m still friends with now. Manchester was a fantastic city to spend your student years in, and in my opinion has only gotten better. It’s an absolutely incredible place to live. What is your fondest memory of university? Those nights out in the first year will stick with me forever. I’d never lived away for home before, and was still wet behind the ears, however as soon as I got a flavour of independence as a young lad, combined with meeting people from all over the world, I ended up having such an amazing time. I’m very much an accidental business person if I’m honest. In a nutshell, I left university and straight away applied for a council funded graduate scheme, which I was lucky enough to be accepted on. It was a very similar application process to The Apprentice where they filed down four hundred applicants to ten lucky people, of which I was one. You got a £10k salary for the year, a flat in the city centre, and got to take part in four placements across the year. It really was fantastic. Unfortunately at this time, the recession hit, and the entry level jobs which I would then have moved onto work, were all cut. There were very few people hiring at the time, and many of the agencies in Manchester were having a tough time. This in mind, myself and two of my friends set up an agency without thinking of the details. We had a bar jobs and then lived above the bar in the evening. The plan of having our own agency was only ever to ride out the recession, which we did, and then it just grew and grew. What advice to you have for any young marketeers? I honestly believe that now is the best time in history to be a young marketeer. Traditionally, the experts have twenty years under their belts, however the people who are graduating now, have grown up with the platforms that people are now marketing on. My word of advice would be, always look at what others are doing, and make sure you’re keeping with the trends. What advice would you give for those wanting to start a business? Something that I can’t stress enough to people, is that starting a business consumes your life. Make sure you’re in a position where you can pause your social life for long periods of time, as there are much more lows than there are highs in the initial stages of setting up a business. You’ve just got to crack on with it, and with the right approach, and arguably a bit of luck, you circumstances should change. If you could do university again, would you do anything differently? I don’t know whether I’d do anything differently, but I’d do it again in a heartbeat. I’d give everything up in an instant to do university again. Do you have any career highs and lows? The highlight was when we received our first cheque. We’d been working for years it felt like, not paying ourselves, and once we’d done completed this job, we had a decent sum each. The weirdest bit was that it was an actual cheque in an envelope. As a company, I’d say we’ve only ever been paid twice with a cheque, and it just happens that our first job was one of them. I can’t describe the feeling. With business lows, they’re always going to happen, but as a company, we’re very good and getting the positives out of the mistakes, so that we don’t make them in the future. Whats next for you and Tunafish Media? We employ twelve people now, so we’re focusing on planning for the future, and essentially, how we can improve as a business. Our figures are really healthy, and I’m confident that Tunafish Media still has room to grow. I want to thank Sam for returning to the university to talk to me about his fascinating journey so far.